SEOSEON is in the finals of SEMrush Nordic Awards, which highlights the best online marketing campaigns in the Nordic countries. The finale takes place at a gala in Stockholm City Hall on April 25th, where the winner of each category will be announced. SEOSEON is participating in the category “Best online marketing campaign in travel/tourism”, for which we submitted the marketing campaign we created together with the largest Nordic agency for alpine trips, STS Alpresor. SEMrush is highly respected in the business and the winners of the Nordic Awards will be selected by a team of 20 experts, including the marketing executives of IKEA, CBS, Disney, Nordnet and Bauhaus. What are the SEMrush Awards? SEMrush is one of the most popular SEO and digital marketing toolkits in the world. SEMrush Awards, which is arranged in cooperation with Don’t Panic, is a gala organized yearly in Europe, North America and Australia. There are 23 categories in this years SEMrush Nordic Awards, with 2-5 winners per category. The excitement culminates in a gala in Stockholm this April, with hundreds of search engine marketing professionals. The digital marketing company SEOSEON qualified for the finals this year with their Google & Bing Ads campaign for STS Alpresor. The campaign combines ambitious goals, productive multi-channel advertising, advanced analytics and multiple markets (Sweden, Finland and Norway). The primary goal of the campaign was to significantly reduce the ad spend, while reaching the same amount of customers. The goals were not only met quickly, but surpassed, and the results exceeded expectations. Some of the information about the campaign is only visible to the people involved, and secured by a confidentiality agreement, but public campaign goals, strategy, implementation, and results will be published in our blog later in the spring. 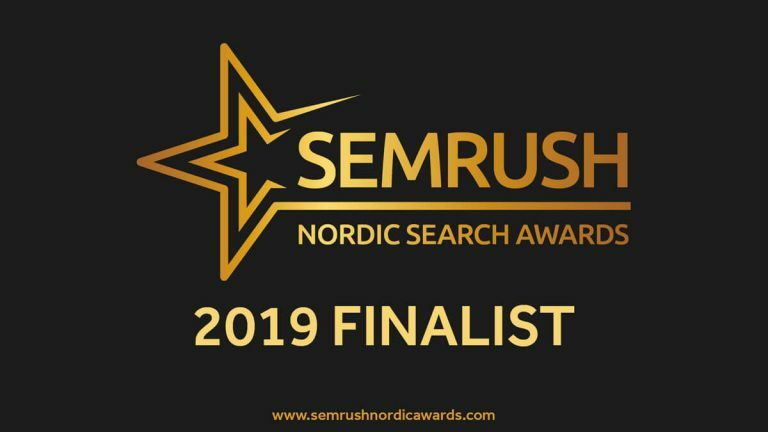 Below is a complete list of this year’s SEMrush Nordic Awards final candidates and a brief description of the campaign content. The final winner of each category will be awarded at the gala in late April. Want to be there to cheer on or network with the best in the industry? Tickets can be purchased directly through the event organizer here.